We found out the date of Redrow’s only public consultation for their plans on the Meadows on Twitter last night. We now have more details. Please put this in your diary, spread the word! Print off one or both of our posters below if you can, and display . Please come along to show your opposition to the loss of part of our heritage parklands. Categories: Objections, Planning Process | Tags: campaign, conservation, council, disposal, health parks, housing development Liverpool, Joe Anderson, Liverpool City Council, Liverpool greenspaces, Loss of Open Space Notice Liverpool, meadows, Redow, Redrow consultation, Redrow consultation the Meadows, Redrow Public event, Redrwo Homes, Sefton Park, Sefton Park campaign, Sefton Park Meadows campaign, Sefton Parklands campaign, sell off Liverpool | Permalink. SHAME ON CEO STEVE MORGAN AND REDROW! Does he know Sefton Park and the Meadows? Has he ever spent any time there, especially on a beautiful spring or summer day and enjoyed its trees, views and sense of space and light? If so, and he still wants to build there, then double shame on him…What motivates him to take away the last of the original Sefton Park grassland areas – and no, we contest the claim that this was always intended for Victiorian villas. We have council minutes from the 1860s and 1870s to challenge this. The Meadows are almost certainly part of Edouard André’s original Sefton Park design and form the grand entrance in and out from Queen’s Drive. Its double row of Lime trees are unique in Liverpool. Its sandstone boundary wall and open grasslands are part of its landscape views and heritage. Why build here Redrow? Presumably because all of this makes it a lucrative place for you too sell expensive but banal houses – by destroying the very character that makes it so attractive?! It’s within Sefton Park’s Conservation Area and alongside the Grade 1 Listed area ( which the campaign is also challenging with English Heritage. The Meadows should be part of its listing!). Not to mention the Meadows as part of Liverpool’s green lungs, its internationally celebrated parks and openspaces, a wildlife corridor, part of our urban natural resources to provide shade, habitat, clean air and combat pollution. Above all, the Meadows are treasured by the people of Liverpool – north and south – as one of our GREAT PLACES TO BE. For relaxation, for leisure, for families, for activities, for quiet space, above all, for their beauty and history. Answers on Facebook or Twitter please!! REDROW will hold a pre-planning public consultation drop in event in September, at which people will be able to comment on their outline ideas for the site. We will publicise the date and details when we know them. The sale of the land is conditional on Redrow obtaining planning approval. 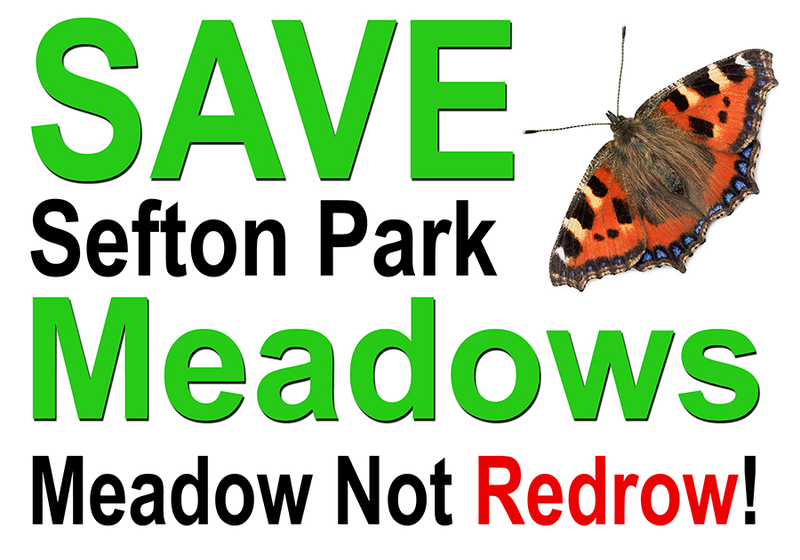 The Save Sefton Park Meadows campaign is fundraising to get expert help to object to planning by Redrow. WE NEED FUNDS URGENTLY. Use the Paypal button on this page or on our Facebook site. 7,500 people signed our petition opposing the proposed sale of Sefton Park Meadows and a record 1,300 people objected to the misleading Loss of Open Space Public Notice (describing the Meadows as ‘incidental open space’ and hidden away in the back pages of the Liverpool Echo), giving Liverpool a free hand to dispose of the land. THIS IS NOT A DONE DEAL! 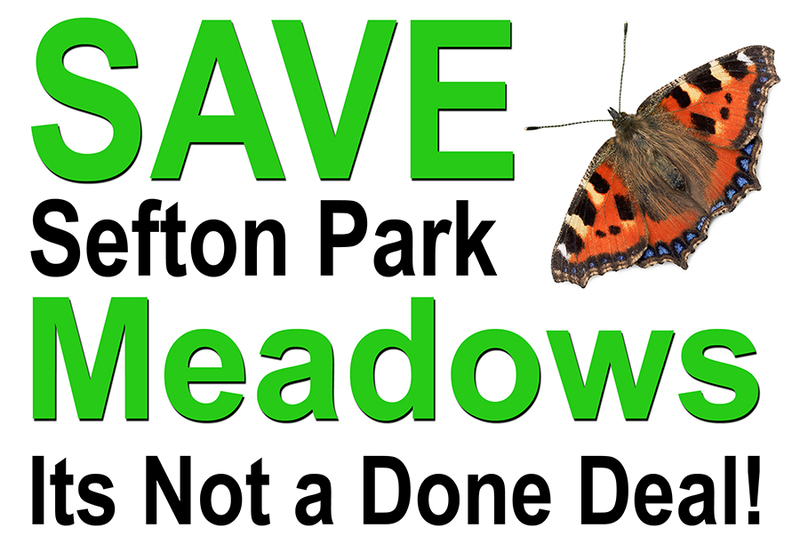 WE WILL FIGHT THE LOSS OF SEFTON PARK MEADOWS AT EVERY STEP. REDROW will submit a planning application in September. We have hired an independent planning consultant to help us prepare our strong objections. We need money for this work to be successful, as it is likely to be a long process. Please help if you can with a donation. We will keep everyone informed of progress. Categories: Objections, Planning Process | Tags: Anderson Land Deals, campaign, council, disposal, green, health parks, housing development Liverpool, Joe Anderson, Liverpool City Council, Liverpool greenspaces, Loss of open space, Mayor, meadows, Redrow, Redrow Homes, Redrow Homes in Liverpool, Redrow in Liverpool, Sefton Park Meadows, Sefton Park Meadows campaign, sell off Liverpool, Steve Morgan | Permalink. We have launched an urgent appeal for supporters to donate to our ‘Fight the Planning Application’ Fund. We understand that a planning application may be submitted as early as the end of August – this month! We have a well qualified planning consultant ready and willing to help us draw up a professional submission on why Sefton Park Meadows should not be built on for luxury housing. We have a very strong case and all the evidence – but we really need professional advice and expertise to get our report spot on and ready for the Council’s Planning Committee. We have already raised over £1,000, thanks to the fantastic response last month. We need another £500 to reach our £1,500 fundraising goal to get this work ready in time and up to scratch. PLEASE HELP US IF YOU CAN. Any donation, large or small welcome. Just use the PayPal button down the page – you can use either a PayPal account if you have one, or a regular credit or debit card if you prefer. For anyone who wants to send a cheque or make a cash donation, please contact pell.scholes@btinternet.com for details. THANKS TO ALL WHO HAVE DONATED SO FAR! WE WILL FIGHT THIS TO THE END – THE DEAL IS NOWHERE NEAR DONE ON THE MEADOWS!